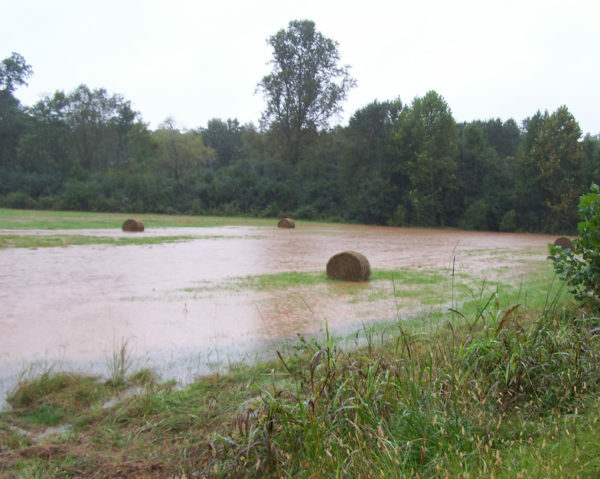 Central Alabama is susceptible to flooding year-round due to its proximity to the Gulf of Mexico and the nearly unlimited supply of moisture it provides. In our case, this can occur from slow-moving summertime thunderstorms, a decaying tropical system, or large storm systems. Sometimes floods develop slowly and forecasters can anticipate where a flood will happen days before it occurs. Often times flash floods can occur within minutes and in a mountainous area, sometimes without any sign of rain. Flooding is the most damaging, costly, and deadly severe weather-related phenomena, costing the United States over $5 billion in property damage yearly. On average, flooding is responsible for more deaths each year than lightning or tornadoes. 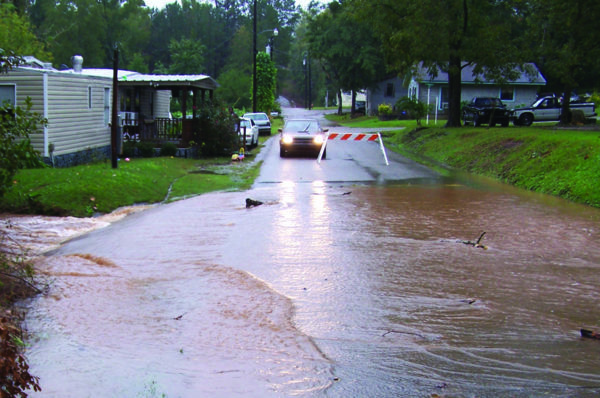 A Flash Flood is flooding that normally occurs within six hours of heavy or intense rainfall. These floods develop very quickly and is a significant threat to life and property. 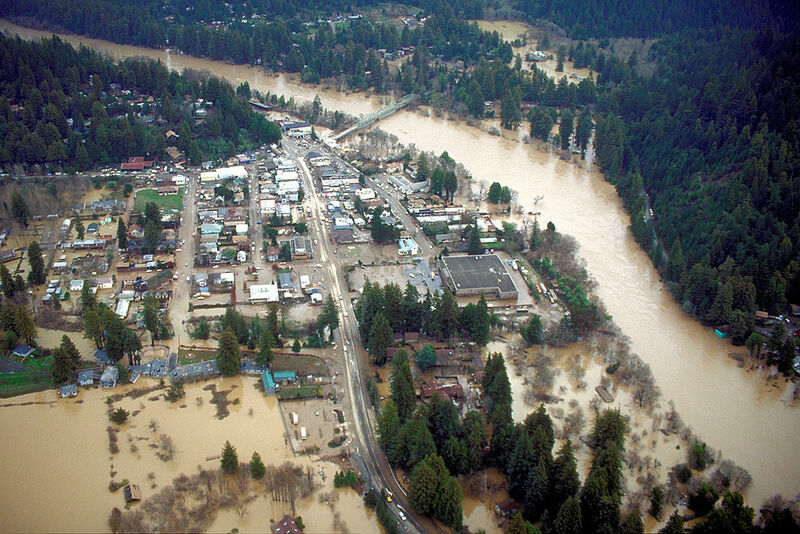 An Areal Flood develops more gradually, usually from prolonged and persistent moderate to heavy rainfall. These floods usually result in a gradual ponding or buildup of water in low-lying, flood-prone areas as well as small creeks and streams. A River Flood is flooding caused by a river or stream overflowing its banks due to recent heavy rainfall or prolonged rainfall over the drainage basin. This, in turns, inundates areas that are normally dry, such as low-lying areas near the river bank. 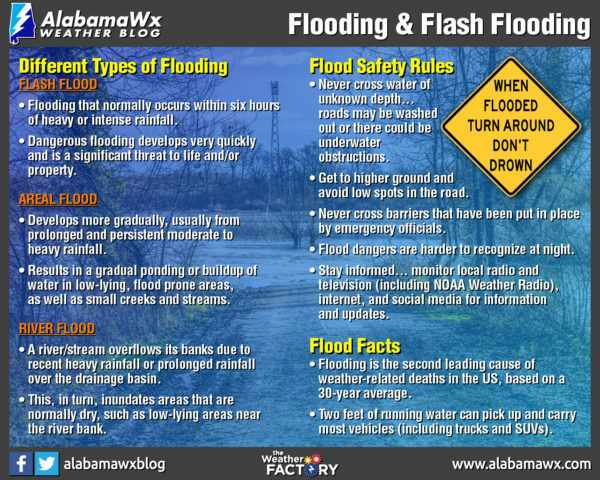 A Flash Flood or Flood Watch means conditions are favorable for sudden short-term (less than 6 hours) flooding, or long duration (longer than 6 hours) flooding, respectively. A Flash Flood or Flood Warning means flooding conditions are imminent or occurring and you should take action immediately. A River Flood Warning is issued when river, stream, or lake levels are expected to rise above bankful. Move to higher ground away from low-lying areas, storm drains, and stream beds. Do not return to flooded areas. Flood waters carry debris that could cause serious injury or death. Water could be moving very quickly just below the surface. Only six inches of fast-moving water can knock an adult over. Children should not be allowed to play or walk near flowing water. Flood waters can rise very quickly, covering your vehicle or sweeping it downstream. Just two feet of water can move most vehicles, including trucks and large SUVs. Road surfaces could be washed away or large debris might be located below the surface. If your vehicle is caught in rising water, abandon it immediately and seek higher ground.